TAIPEI, TAIWAN--(Marketwired - Sep 25, 2017) - When George Ballantine, founder of Ballantine's whisky, set up shop selling premium goods in 1827, he believed that doing things differently and having unwavering vision were fundamental to creating a modern-day business that would continue to capture the imagination of whisky drinkers. Today, that belief is still alive, and for the first time in its 190-year history, Ballantine's has unveiled three outstanding 15 years old Single Malts, each unique in flavour and from three of its signature distilleries: Glenburgie, Miltonduff and Glentauchers. This innovative move sees Ballantine's look to meet the growing demand for Single Malts and allow a new generation of discerning drinkers to discover the unique flavours of three of the signature malts from the heart of Ballantine's. Fusing the traditional and the modern, each Single Malt celebrates nearly two centuries of heritage and tradition in the beautiful and historic Speyside region of Scotland -- whilst showcasing founder George Ballantine's need to do things differently. The packaging itself is an outward expression of this fusion, taking inspiration from Scotland, the home of the brand and showcasing the natural stone of each of its distilleries. Now available The Glenburgie, Miltonduff and Glentauchers Single Malts offer diverse flavour profiles, each exceptionally smooth and aromatic but with distinct characteristics. The Glenburgie Single Malt forms the heart of Ballantine's whisky character, delivering concentrated fruitiness and honeyed sweetness. Perfectly balanced, with aromas of soft red apples and pears, this whisky has a full and velvety texture and a long, round finish. The Miltonduff Single Malt forms the foundation of Ballantine's whisky character, bringing warmth and power. Floral with a subtle hint of cinnamon spice, this whisky is extremely smooth with gentle liquorice flavours and a long, warm finish. The Glentauchers Single Malt delivers the smooth and delicate lingering finish of Ballantine's. With hints of delicate floral heather on the nose, and soft berries and barley sugar sweets on the palate, this whisky has an incredibly long, luscious finish. Sandy Hyslop, the fifth Master Blender for Ballantine's, worked with his talented team to craft the first ever Single Malt Series. He comments: "This is a truly exciting time for Ballantine's. Since 1827, Ballantine's has been creating award-winning whiskies, and the Single Malt series is a bold expression of both Ballantine's heritage and sense of innovation within the world of whisky. "Each of these 15 years old Single Malts has been made with the same craft, care and authenticity that goes into every bottle of Ballantine's, whilst pushing the boundaries of what is currently on the market today. I am certain that whisky drinkers, connoisseurs and collectors alike will enjoy these new whiskies." 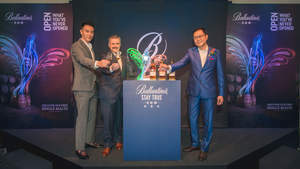 Taiwan, the 4th largest whisky market by value and the most vibrant Single Malt market in the world, is the first country to officially launch the Ballantine's Single Malt Series. From 23 September to 1 October 2017, Scotch whisky drinkers will be among the first to taste the three distinct flavours of the Ballantine's Single Malts, and learn about its 'stay true' heritage and innovative spirit through an interactive experience in the heart of Taipei. The Ballantine's Single Malt Series is bottled at 40% ABV. The release of the series is a testament to the spirit of George Ballantine and the remarkable people, places and events that have been part of the brand since 1827. Ballantine's is the No.1 Scotch whisky in Europe and the No.2 Scotch whisky in the world with the range selling over 70 million bottles a year worldwide. Ballantine's has won more than 130 trophies and medals at international competitions in the past 10 years for its outstanding quality, as a result of its unique richness of character and perfect balance. The range, from Ballantine's Finest to the exclusive 40 Years Old, is the most extensive in the world of Scotch and is maintained by Master Blender Sandy Hyslop, continuing the brand's tradition of Master Blenders that dates back to 1827. In 2013, Ballantine's continued its innovative approach by launching Ballantine's Brasil, a spirit drink made from selectively cask steeping Scotch whisky with Brazilian lime peel. Chivas Brothers is the Scotch whisky and premium gin business of Pernod Ricard, the world's no.2 in wines and spirits. Chivas Brothers' award-winning portfolio features some of the world's most revered Scotch whisky brands including Chivas Regal, the world's first luxury whisky and the No.1 Scotch whisky in China; Ballantine's, Europe's No.1 Scotch whisky; The Glenlivet, the world's No.1 single malt whisky; and Royal Salute, the world's only exclusively prestige Scotch whisky range. The portfolio also includes two of the world's leading English gins -- Beefeater, the world's most awarded premium gin, and Plymouth gin -- plus a selection of highly acclaimed single malt whiskies, including Aberlour, Longmorn, Scapa, Strathisla and Tormore. The range is completed by a collection of blended Scotch whiskies operating in many of the world's key whisky markets which includes 100 Pipers, Clan Campbell, Something Special and Passport Scotch. Brand ambassador and Taiwanese actor Sunny Wang, Sandy Hyslop, the fifth Master Blender for Ballantine's and Terence Ong, Managing Director for Pernod Ricard Taiwan are in Taipei, one of the most vibrant whisky markets in the world to unveil the first ever 15 Years Old Single Malt Scotch Whisky Series from Ballantine's.